"Attention passengers. Attention. This is your captain speaking. We are approaching a minor hurricane and might experience some violent and potentially fatal turbulence. Remain calm. If you are unable to do this and uncontrollable panic sets in, our cabin crew Meghan and Shivan are equipped to handle you. Or in the very least, keep you entertained Thank you for choosing Air Bermuda: Air Bermuda! We keep you coming, back!" A new comedy set in mid-air! Fasten your seat belts, get a drink and try to relax, it's going to be a bumpy ride! A new play by Kei-Ella Loewe in collaboration with Rosa-Karroo Loewe, Tazme Pillay and Tarryn Naude. Performed by Rosa-Karoo Loewe and Tazme Pillay. And featuring Jamie-Lee Money as 'The Captain'. From the director who brought you In Whorefish Bloomers! The Waitresses Lament, Avante-Gauva Productions is cooking up a new two-hander. With performers Tazme Pillay (Out Of Bounds, Woolworths) and Rosa-Karoo Loewe (The Room With Three Windows), Winging It! promises to be unlike any flight you've ever experienced. In flight snacks will be on offer. Please have your correct change ready should you want a snack or beverage off the trolley. Kei-Ella Loewe graduated from UCT Theatre and Performance in 2015 with an Honours in Theatre-Making, where she received the Mavis Taylor Award for most promising director. Since then, she has directed and written three original works - Monster performed at the Cape Town Fringe in 2016, In Whorefish Bloomers: The Waitress's Lament in 2017 and 2018 (Alexander Bar, Cape Town Fringe, Pop Art Theatre in Joburg and The Drama Factory in Somerset West). The show enjoy sold out performances and was nominated for Freshest Show and Fresh Creative (Directing) Awards at the Cape Town Fringe 2017. And The Room with Three Windows which premiered at the National Arts Festival in 2018. Winging It! Will be her fourth. Outside of play-making she works as a technician and stage manager at various institutions in and around Cape Town. 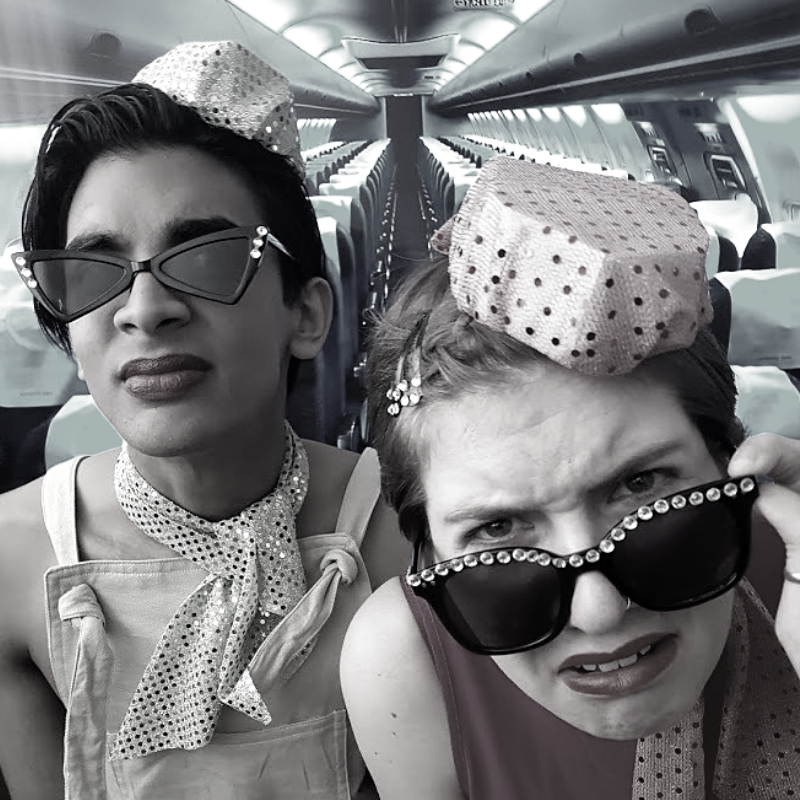 Rosa-Karoo Loewe and Tazme Pillay graduated from UCT Theatre and Performance in 2017, in Theatre-Making and Acting respectively. Tazme Pillay is a Durban-born actor and performance artist. His performance in the Standard Bank Ovation Award winning Out Of Bounds (2016) garnered him a Best Actor nomination in the 2016 BroadwayWorld.com Awards. He also presents and exhibits performance art, a passion which has seen him present work across South Africa. He hopes to redefine the emphasis on patriarchal masculinity in the theatre and eradicate the ideal of the hetero-normative actor. Advocating that the yardstick for roles be shifted, he promotes the visibility of queer masculinity on stage. Rosa-Karoo Loewe is making art and waiting tables. She has been working as a stage manager and technician and made her professional debut in The Room with Three Windows at the National Arts Festival in 2018.